My name is Chloe and I am new to this blog! 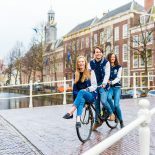 I have been living in The Hague for a year and a half and I am a sophomore in International Studies at Leiden University on The Hague’s campus. I am involved in the Greenpeace Student Group The Hague and this is the first Greenpeace student group established in The Netherlands. This means we have a lot of liberty when it comes to organizing events and taking part in projects we want to engage in. I was not aware there was such a group until last February, when the leaders held an event to find more students with a passion for environmental protection. I was really interested to get involved so here I am; I am now responsible for this month’s project, which is called Waste Week. Have you heard about the Waste Week concept before? It is a project that several organizations and universities carry out to raise awareness for waste prevention. And this is now! We have organized a waste week in The Hague. From Monday to Sunday, we ask people to post a picture of their food and the waste they generate from cooking their meal. This Friday, we will hold an event on campus with free food and we will display all of the pictures we collected from our Facebook page! We will talk about how we can reduce our daily waste as students and we will also involve the university, as we would like to improve our surrounding environment. This is a great chance to get involved in an active group! We also contacted our high schools to ask them to participate to this Waste Week. Over 100 people are participating virtually. And I hope that following our LoveFoodNotWaste Night, more students will join our group. To go further with this project, I also would like to conduct research about what supermarkets in The Hague do with their waste and if there is any way we can donate this waste instead of trashing it. Indeed, the food we will provide on Friday will be a donation from a supermarket that has already contributed to several student events. I am really excited about this project! And there are many others the Greenpeace student group would like to undertake. We have an assigned project for each month and depending on what you like to focus on, you can choose to be responsible of a project. We meet every two weeks to share ideas and to organize our events. So, if you have a strong interest for environmental protection, this is a nice opportunity for you! Thanks to this experience, I think we can strengthen many skills that will be useful for our future career! Studying in The Hague is not only theoretical; it is also being active in organizations that have an impact on a global scale! And this is why I am delighted to study in this city! This is so great! Well done, Chloe! Thanks Sunny! Looking forward to our LoveFoodNotWaste night! This entry was posted on March 18, 2015 by in Student Life.